YYZ Bambina: Canadian Cash #Giveaway! Love giveaways? Check out the Giveaways Open to Canadians Facebook group. It's a place for Canadian bloggers and contesters to share and enter fabulous Canadian giveaways. I post ALL of my giveaways there! 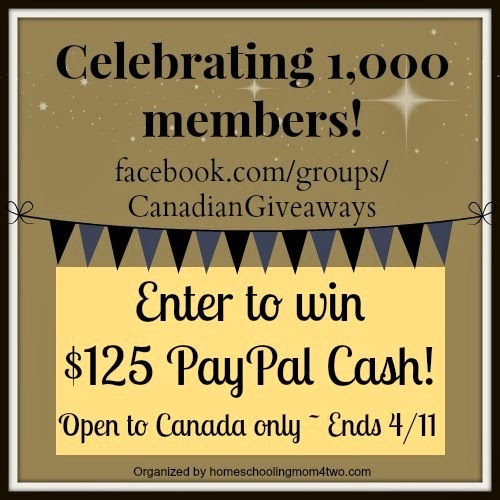 I've joined Homeschooling Mom 4 Two and some other awesome Canadian bloggers to celebrate reaching 1,000 members. We're offering our fans and readers a PayPal cash giveaway that is ONLY open to Canadians! So if you are Canadian and love giveaways, be sure to enter for your chance to win! Enter to win $125 PayPal cash! Please note: Entries will be verified. Do not claim an entry if you have not completed it.